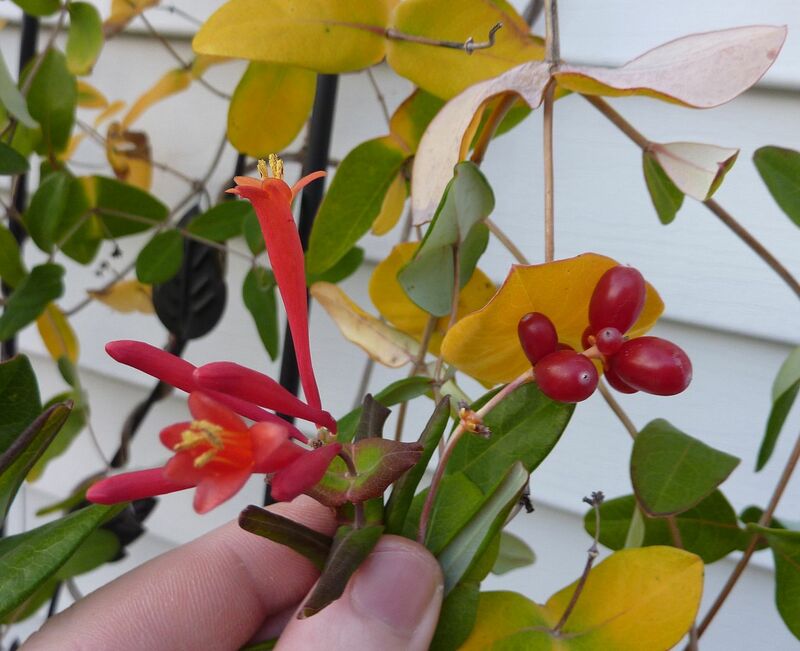 Just to show off what the coral honeysuckle, Lonicera sempervirens, has to offer in the late winter. It's still flowering sporadically on new growth. It's got a few berries too. It's staying nice and compact even though there's a cable wire running next to it, a simple cut was all that's needed to get it to stay away. And it hasn't grown back in that direction at all. That said, my only complaint about this plant is it's to easy to snap off a stem. At the start of the year maybe 40% of the plant died because a squirrel chewed through one of the stems at the base of the plant. First frost all those leaves should fall off and the plant will go dormant until next spring. Spring time is the best time for flowers because of all the new growth bursting out of the plant.